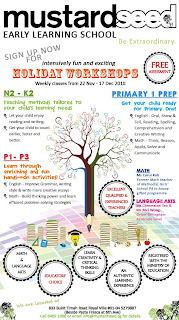 Early Learning School, Mustard Seed, will be holding weekly workshops during the upcoming school holidays, from 22nd November until 17th December for N2-P3 students. These activity-based workshops will help to improve your child's Math and literacy skills in preparation for the new school year. Mustard Seed is a dynamic school that teaches Language Arts and Math for children in their early years, aged 3 to 10 years old. All the teachers are highly qualified and experienced and the classes are kept small (approximately 6 per class) to allow for maximum interaction between teachers and children. The lessons are all tailored to each individual child's learning needs. The children at Mustard Seed are always engaged in fun, exciting and authentic learning experiences that help them to develop creativity and critical thinking skills. This is central to the school's philosophy of cultivating a lifelong passion for learning. 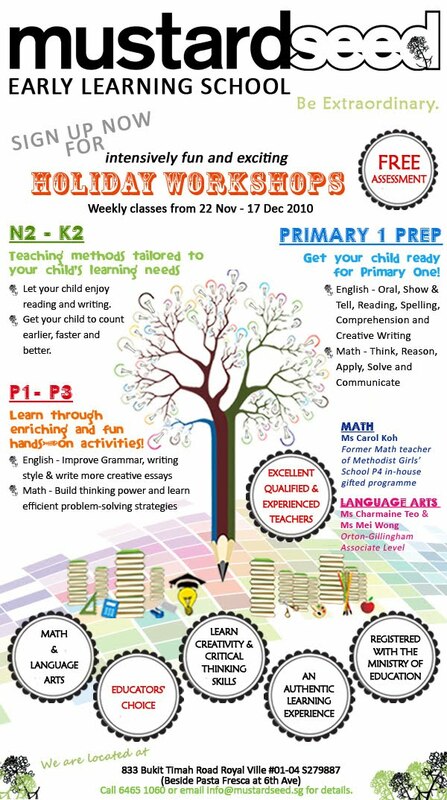 The Math Programme at Mustard Seed has been created by Ms Carol Koh, a former Math teacher of the P4 in-house gifted programme at Methodist Girls' School, one of Singapore's top schools. Attention is paid to test-taking skills in line with MOE standards and the children are shown engaging and creative ways to kick-start their interest in Math. Mustard Seed’s holistic Language Arts Programme comprises of lessons that are multi-sensory, ie. action-oriented with visual, auditory and kinesthetic elements. There is constant interaction between the teachers and the children and all language skills are reinforced by having the child listen, speak, read and write. The Language Arts Programme also consists of creative writing, whereby the children go through exercises that help to improve their literacy and reading fluency, as well as develop their creativity and story-telling skills. Mustard Seed would like to offer all SKP readers a Free English/Math assessment for their children (for levels K1, K2 & P1). If you are interested, call 6465 1060 or email info@mustardseed.sg to make an appointment, and quote 'SKP' when making the appointment. This offer is only valid for the first 100 SKP readers, and is available till 30th November 2010 only. Mustard Seed is located at 833 Bukit Timah Road, Royal Ville #01-04 S279887 (beside Pasta Fresca at 6th Avenue). This sounds like a wonderful program: very enjoyable for its young students! Best wishes for your classes!